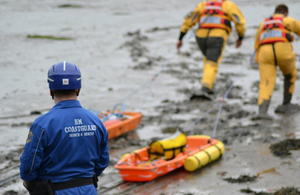 A 17-year-old girl has been rescued from mud up to her waist off the beach at Crosby. At 3.52pm on Wednesday 23 July 2014, Liverpool Coastguard was contacted by Crosby RNLI lifeguards reporting that a young person was trapped out in the mud approximately 100 feet from the shore. Coastguard mud rescue teams were sent to the scene along with responders from Merseyside Fire and Rescue and the RNLI Hovercraft from New Brighton. The crew of the hovercraft recovered the girl from the mud and the 17 year old was transferred to responders from Merseyside Ambulance Service. Despite the warm and dry weather we’ve been having recently, there are still plenty of muddy patches along parts of our coastline that we need to keep a lookout for. This is the second mud rescue we’ve had in as many days. If you do find yourself stuck though, try to spread your weight as much as possible, avoid moving and stay as calm as you can. Call 999 and ask for the Coastguard and we’ll get our specially trained teams out to you as quickly as possible. Discourage others from attempting to rescue you, since without the proper equipment they could become stuck in the mud as well.